With a certification from the WD Functional Integrity Testing Lab (F.I.T. 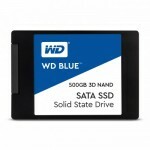 Labâ„¢), every WD Blue 3D NAND SATA SSD is verified for compatibility with a wide range of desktop and laptop computers. Every WD Blue 3D NAND SATA SSD goes through extensive compatibility and reliability testing to ensure it meets the high standards of the WD brand. Monitor your driveâ€™s available capacity, operating temperatures, SMART attributes and more with the WD SSD Dashboard. AcronisÂ® True Imageâ„¢ WD Edition software, available as a free download, can clone drives and backup your operating system, applications, settings and all of your data.